The house is part of a large property . It is very sunny, and quiet . It has a private garden and an access to the main garden which includes a swimming pool open in the season. On the ground floor, entrance, dining room/kitchen, living room with a fireplace. On the first floor, two bedrooms , a bathroom and a water closet. Ideal location to visit the Champagne region, play golf ( 4 excellent golf courses within or less a half hour drive), reading and relaxing. many excellent restaurants nearby. possibilities of horse back riding , playing tennis, hiking in the vineyards . Not advisable for young children. The property has been family-owned since 1953. It is both part of the village and overlooks the fields and the Champagne wineyards around . Dated early XIX century . Was a US army HQ at the end of WW2. It offers the unique feeling of being part in the life of a village of winegrowers while enjoying the country 'quietness . Huge collection of French and English books in the property, available on request . Small assortment of English books in the house. The pool is located in the main garden of the property . It is surrounded with flowers and an old gazebo. Depth: around 2 meters . Alexander and his beautiful wife have few equals as host. There when needed but unobtrusive in every other way. Also they know the areas and it’s extensive history and have the inside line on some gorgeous champagne. Really lovely cottage in rural France which is well equipped, comfortable, spacious and is situated within the grounds of the owner's house. The location is very rural, surrounded by vineyards - the views are amazing. It is possible to go walks around Trigny which were very pleasant. We received a very warm welcome from the owners who speak excellent English, they provided good local knowledge and suggestions where to visit, eat, etc. Although the cottage does not have a washing machine, we were offered the use of the owners' laundry facilities which we used. Trigny has a tabac/restaurant right next door and we found the owners very friendly. Muizon, nearby, has a reasonable sized supermarket and a boulangerie which is superb. We took a trip to Reims which has s less than 30 minutes, Laon which is a bit further and lots of smaller towns and villages in the area. It is relatively unspoilt around here and would recommend visiting this area and would also recommend this cottage. 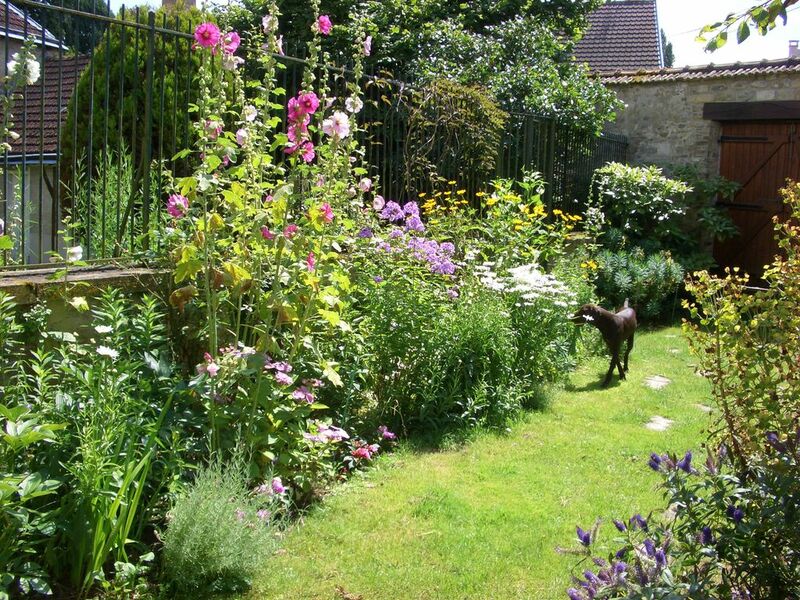 This holiday cottage in Trigny Champagne exceeded all of our expectations for a peaceful week in beautiful surroundings. Nicole and Alexandre were the perfect hosts and made us feel extremely welcome, providing us with a wealth of information and advice on the local area, places of interest, and amenities. The cottage is brimming with character and charm and is perfectly equipped to ensure a comfortable and relaxing stay. The private rose garden to the front of the cottage is a haven of tranquillity and the ideal place to sit, relax and read, with plenty of inspiration for artists. The large private gardens to the rear of both the holiday cottage and the adjacent hosts’ property and where the Victorian style swimming pool is located, is absolutely stunning, with many hidden areas for lazing about beneath the shade of apple and walnut trees. There are countless places which are well worth a visit in the beautiful surrounding countryside and towns, particularly for those who have an interest in military history, and the sleepy little town of Trigny itself is nestled amidst champagne vineyards which become a hive of activity during the harvesting period towards the end of August. This cottage provided us with the most relaxing holiday that we have had in years, and we are looking forward to returning as soon as we are able to. Many thanks again to Nicole and Alexandre. This is a very comfortable house in a lovely village in Champagne. We enjoyed our stay in this very comfortable home within a complex of charming old farm buildings. It is well equipped for cooking, but Reims is only 20 minutes away with many wonderful restaurants. There are also a few in villages nearby, though they may be closed in August! An excellent Intermarche is nearby, and a wonderful bakery. Alexandre and Nicole were extremely kind and knowledgeable. Lots of local information. A great find for us, as we travel with bikes and the area riding is superb. We absolutely loved our stay at this beautiful cottage in the lovely Champagne village of Trigny. It was the highlight of our stay in Europe. The cottage was beautiful and very well equipped and the beds were extremely comfortable. I loved the bathroom with it’s deep French bathtub. The gardens were absolutely beautiful with hundreds of new roses blooming every day while we were there. Alexandre and Nicole were wonderful hosts and we really enjoyed and appreciated the lovely cut flowers from Nicole and our Champagne and conversation in the terrace of the main house with Alexandre on our first night at the cottage. I would love to spend three months or more there reading my way through the contents of the bookcase and just sitting in the garden and exploring the lovely countryside nearby. Highly recommended!!! Our only regret is thatcher couldn’t spend much longer there!!! A great property, in a quiet and peaceful little village- no noise at all. The house was spotlessly clean, with comfy beds and sofa. Everything you could need was in the kitchen, along with jam, tea, coffee and water, all which was much appreciated. The gardens are at your use and are so beautiful, quiet, tranquil, with an old swimming pool, which was lovely to swim in. Alexandre was a great host and I 100 per cent recommend the place- an excellent holiday spot! ideal location for Champagne wine tourism, playing golf, visiting famous museums, churches and historic monuments related to both World wars.